As I rounded a curve along the backroads of southern Pennsylvania, I saw a very peculiar sight. In the field to my left were enormous stacks of bailed hay, perhaps 12 feet high. They all had primitive faces (the closest one sticking out its tongue), and they were all facing the same direction. I knew I had seen them somewhere before. 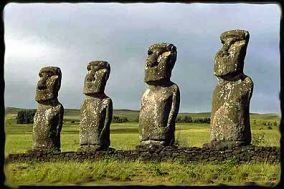 As I walked among them, I realized that some farmer had unwittingly recreated the enormous stone statues (gods) of Easter island. What a delightful irony this was, to find these icons right here in the United States! 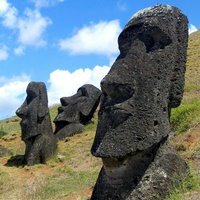 If you don't know about Easter Island, do a search. It's a very interesting tale of a primitive culture that overpopulated its island, clearing all the trees for crops, erecting stone gods to have bountiful harvests, and eventually toppling their gods in anger as the crops failed and the people were starving. Canon 10D, 28-135mm IS lens at 28mm, f11, 1/10 sec.